StressLic® w/Bio-Mos supplement is specially formulated to enrich the diet of cattle subjected to stress due to weather, shipping, illness, or periods of high production. This unique supplement is second to none when compared to other low-moisture blocks. This block is the product of a state-of-the-art patented process that provides a unique 24-hour feeding system. StressLic® w/Bio-Mos is an exceptionally dense block that will give you the most for your money. 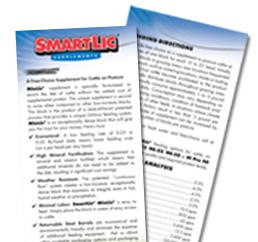 Minimal Labor: SmartLic® StressLic® w/Bio-Mos is easy to feed. Simply place the block in areas of easy access to cattle. 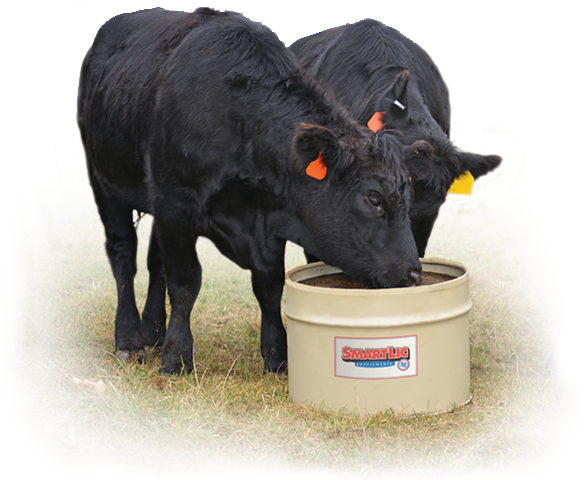 Based on 0.75 lb intake, StressLic® w/Bio-Mos will provide 10 grams of Bio-Mos and contains up to 200% of the NRC requirements for trace minerals, with 30% of the guaranteed manganese, copper and zinc provided in metal amino acid complex form that gives your cattle a special edge during times of high production or stress. Trace mineral status affect herd reproduction performance and health. Cows consuming balanced, highly bioavailable trace minerals are more likely to produce healthy calves that perform well at weaning. Animals most likely to benefit from complexed trace minerals include cattle experiencing weaning, shipping, adverse weather conditions, or dairy cattle in high production. Stress 22 with complexed trace minerals is the perfect choice for these cattle. Provide free choice as a supplement to pasture cattle or cattle in drylot at the rate of one block for each 15 to 25 head. Place in lot or pasture near areas frequented by livestock, such as watering locations, shade or loafing areas. Cattle typically consume 0.75 pound per head daily. Consumption may vary depending on climate, grazing conditions, condition of livestock and/or availability of other feeds. In situations where climate and/or other factors result in consumption less than 0.75 pound per head daily, StressLic® w/Bio-Mos consumption may be increased slightly by providing additional blocks in each pasture or lot. Provide access to fresh water and free-choice salt at all times. 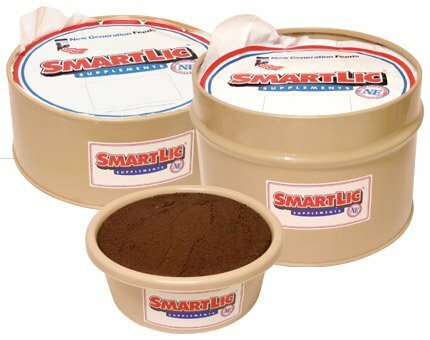 For other SmartLic® feeding options for cattle on pasture, or when feeding stored forages, feed NE-12, NE-22, NE-30, Hi-Pro 40 or Pasture 40 depending on forage quality and required protein supplementation. StressLic® w/Bio-Mos Supplement contains metal amino acid complexes manufactured by ZinPro® Corporation and high levels of fortification for stressed cattle.